Providing an introduction to stumpwork, this design by Cathy incorporates a basket worked in needlelace, containing flowers using three different raised embroidery stitches. A mixture of pure silk, cotton and stranded embroidery threads will be used to create the design, which may then be attached to a box lid as shown, or mounted as a picture, as required. Some experience of stitching would be useful. Suitable for beginners to stumpwork. All materials and equipment will be provided, but you may wish to bring both your own 4" and 6" embroidery hoops if you have them. A seat frame is best for the 6" hoop, but not essential. Alternatively, you may borrow a standard hoop for the day. Standard and seat frames are normally also available to purchase). £49 per person including all materials and a bronze coloured satin covered box as pictured (the box measures 8cm across). 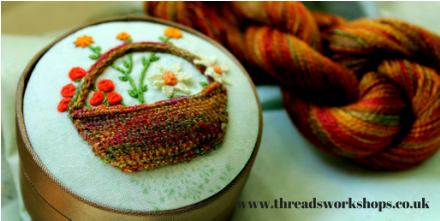 After tracing the basic design onto the cotton background fabric, you will firstly work the basket in needlelace using pure silk variegated thread, before working the flowers using various raised embroidery stitches, traditionally used in stumpwork. We aim for you to part-complete the design by the end of the workshop and feel confident to complete the project at home.